Back in late March, art writer and historian Rowan Derryth contacted me to ask if I would consider participating in an exhibition at LEA1 (a Linden Endowment for the Arts sim). Called A Rusted Development, the build she envisioned and curated would be a collaborative effort by a number of artists led by lead designer Haveit Neox. The other artists who were accepted the offer were Rose Borchovski, Artistide Despres, claudia222 Jewell, Bryn Oh, Scottius Polke, PJ Trenton, Blue Tsuki, Stephen Venkman, Eliza Wierwight and Trill Zapatero. 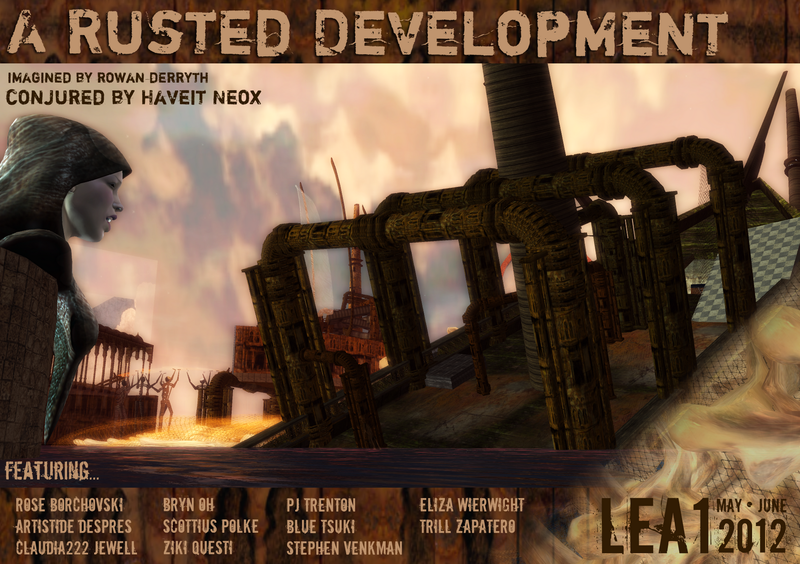 A Rusted Development (click for a teleport) officially opens tomorrow, Saturday, 12 May, at 2 pm slt, and will be on display through June. Haveit gave a story to the history of A Rusted Development: “The fabled merchant city that rode atop the back of a gigantic whale met with a calamity that ended its existence abruptly. In the middle of the ocean, a horrific storm caused two huge ships carrying toxic chemicals to collide into the swimming whale city. The whale and all the populace died in the flood of chemicals that saturated the waves. I was delighted to accept the offer, but as I began to think about what I could contribute I decided that a gallery of two-dimensional photographic images wouldn't really do the build justice. In addition to thanking curator Rowan Derryth and all the other artists with whom it was a pleasure to work alongside, I must in particular thank my friends and extraordinary scripters Caer Balogh and Tiff Trommler for their patience and creativity. I also thank Rose Borchovski, whose beautiful work at Two Fish (which is closing soon) helped inspire my work here. Indeed, a ‘falling apart’ script by Caer used in Rose’s work has been replicated here with some minor changes, with results intended to be more of an aesthetic parallelism than direct appropriation. Thanks to Barbie Pomilio and Juno Angerona (triamix) for their support. I've not said much here about the work of all the other artists, but it's striking and beautiful. I especially like Bryn's contribution (can you find it?) and the way claudia ably wove her distinctive work into Haveit's build. I hope to write more soon. You can read more on this build in posts by Rowan Derryth and Quan Lavender, and on the LEA blog. Oh you came up with an intriguing creative idea Ziki! I look forward to seeing it!